Waking up the next morning, I did not feel awesome at all. But I was unwilling to waste any more time in Paris. This was already a short trip and I didn’t want to spend any more of it in our apartment. We decided to do a self-guided walk from Rick Steve’s book, rue Cler Walk. I know that there has been a bit of talk about this being so hyped by Rick, that it has been nicknamed “rue Rick Steve” and that is partially true. Because of his numerous accolades, the area is heavily touristy. But then again, so is La Tour Eiffel, Arc de Triomphe, le Louvre, etc. Since Paris is one of the most visited cities in the world, you are going to run into tourists. That being said, if this had been my first or even second trip to Paris, it probably would not have made the cut. But it is a cute little street and the shops are lovely, so off we went. Getting there was super easy from our apartment in the Bastille, the metro was a straight shot, no changes required from Bastille to Ecole Militaire. Rue Cler is a cobblestone pedestrian only street in the 7th arrondissement. Walking down the market lined street gives you a glimpse into how Parisians shop in their daily lives. You will find the Boucherie (butcher), the Boulangerie (baker), well I didn’t see a candlestick maker but you certainly get the feeling that there might have been one here at some point. 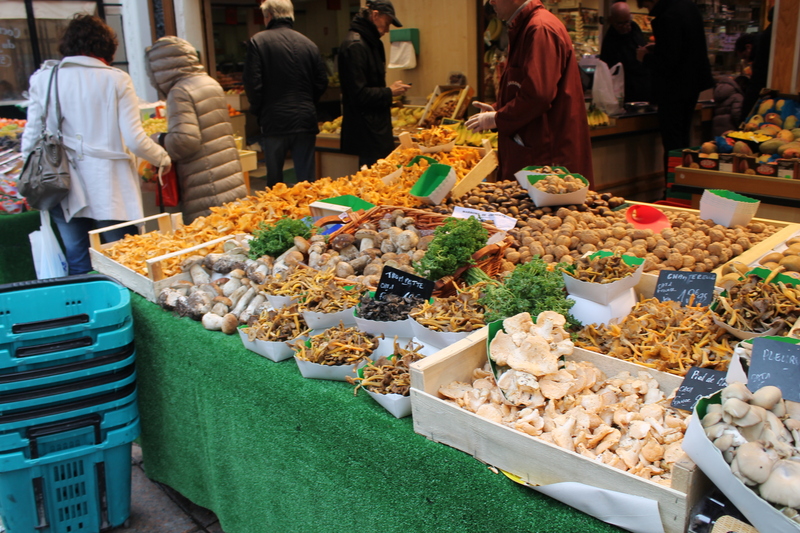 Now this short three block walk is jam packed with anything you could possibly want to enjoy a typically French breakfast, lunch, dinner or dessert. One of my favorite things about being in Paris is the pride that the local shopkeepers have for the quality of the products they make and sell. Many of the shop owners are multi-genrerational owners and it doesn’t take much to get the butcher talking about his meat or the grocer about his produce. My french is minimal and all of the folks I attempted to speak to in French were lovely and laughingly willing to speak in English to spare me too much embarrassment. 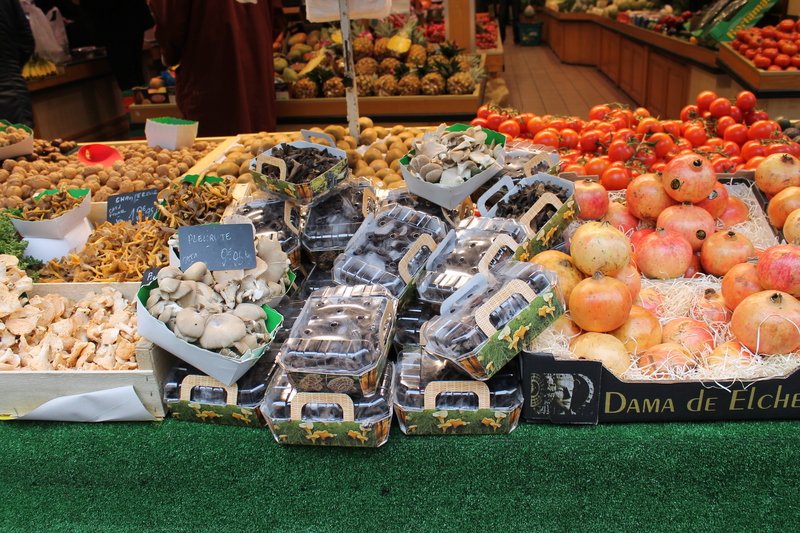 Shopping for food in Paris is a multi-sensory experience. Shoppers are expected to touch and smell their potential purchases, how else can you make an educated assessment? It is not uncommen for the shopkeeper to voice his opinion on your culinary selection and you would be wise to listen to the suggestions offered you. The shopkeepers in Paris are not trying to move day old bread or over ripe produce, they take pride in the food they are selling and certainly do not want you to walk away with a subpar product and then pass that negative experience on to the next potential customer. Yes you can get the non-personal, typical American grocery store, if you are looking for that. The Monoprix fills that bill. But if you are shopping in a sidewalk market, be prepared for a relative stranger to be all up in your shopping business, its not just his job, its his life’s work. Its not for some, I love it. Certainly rue Cler is not the only place in Paris that you can get this kind of attention, as a matter of fact, the dinner that I cooked in this post, was decided on by a lovely butcher that kept me there for nearly thirty minutes talking about meat, his father (90 years old and living above the shop) and bemoaning that he would probably be the last of his family line to run this butcher shop as his son wanted to do something else with his life and had no interest in continuing the tradition. I am not going to detail every shop/cafe/etc. along rue Cler and the surrounding streets, but I will hit a couple of my favs. For history buffs, the oldest building on the street is a fairly nondescript house that now houses a deli. It is a survivor from the early 1800s when this area was nothing more than a village on the outskirts of Paris. 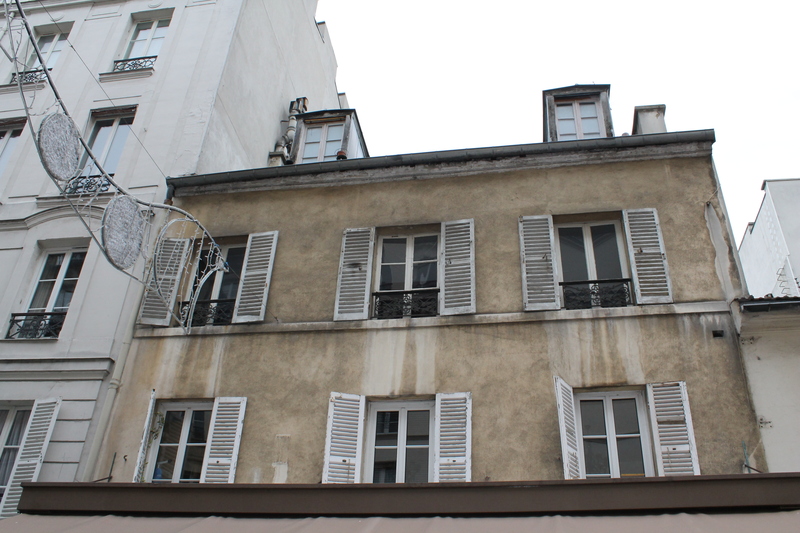 It has none of the architecture that Paris is famous for, but the fact that this little building survived for some reason, is at least worthy of mention. Also of historical as well as cultural mention, a traiteur and creperie called Ulysse en Gaule has an unusual claim to fame. As the gorgeous hand painted sign proclaims, a boucherie chevaline (a horse butcher) was the former occupant. I certainly did not see horsemeat crepes on the menu, but the sign is a reminder of days gone by and dare I say…progress! 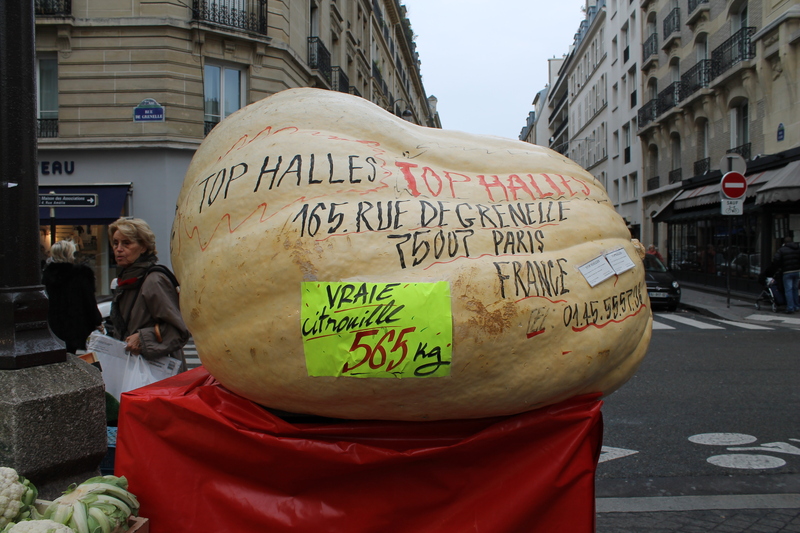 Top Halles boasts a generously sized squash…a must see if you have ever taken a road trip and stopped at any of the “World’s Largest..anything” signs. Some of the side streets are well worth the detour and rue du Champs de Mars is my favorite. Two gourmet food stores are well worth the turn. 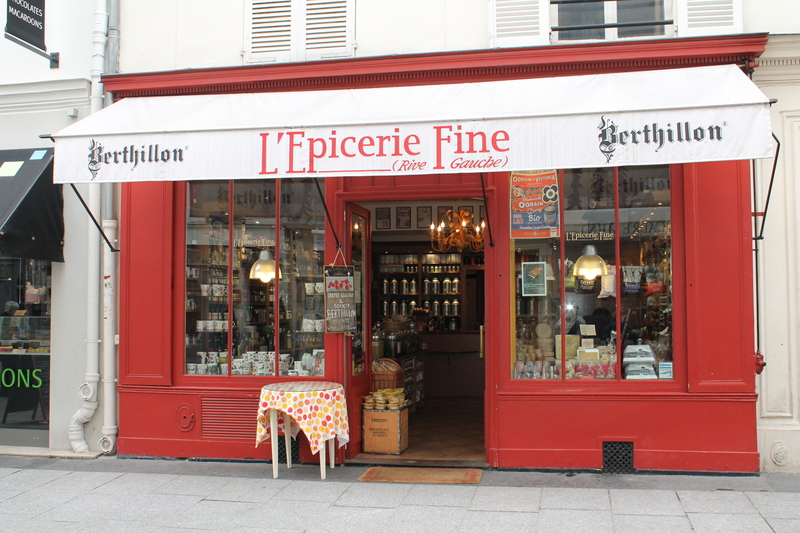 L’Epicerie Fine is a fine foods shop that will wow you with both its impressive collection of fine foods as well as the shopkeepers willingness to help you choose food whatever your occasion. Do not be surprised to be offered tastes of everything from caramel to aged balsamic, even if you only came in for the ice cream (which is Berthillon and absolutely amazing!). 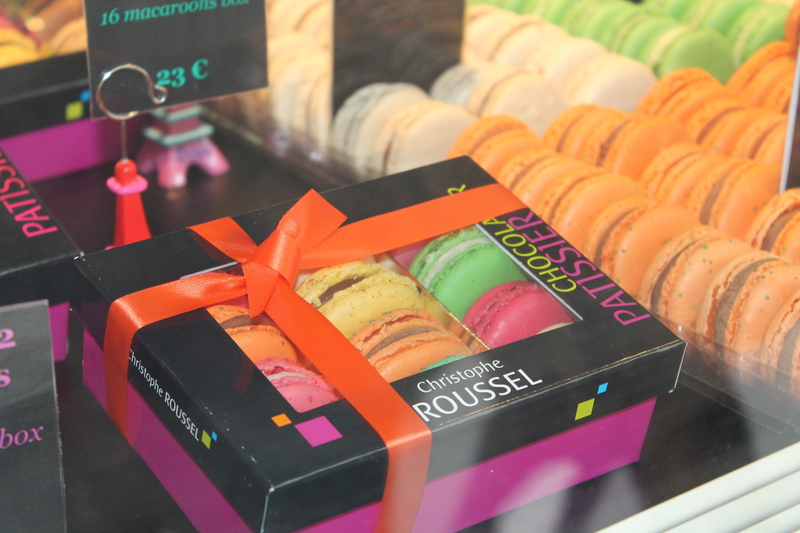 As if your tastebuds didn’t get enough there, right next door to L’Epicerie is Christophe Roussel Boutique and Chocolate Bar. Yep, you read that right…Chocolate Bar. It might look a bit out of place, an ultra modern facade amid such historical looking storefronts, but the window displays are worth a second, or even third look. Rows and rows of macaroons, in beautiful jewel tones, bring a new meaning to “Taste the Rainbow.” They are almost too pretty to eat, but I assure you, I managed! I was starting to feel better, and mom was getting hungry so we decided to stop at Le Café du Marché. This is right on the corner of rue Cler and rue du Champs de Mars. It offers indoor as well as outdoor seating, perfect for people watching! 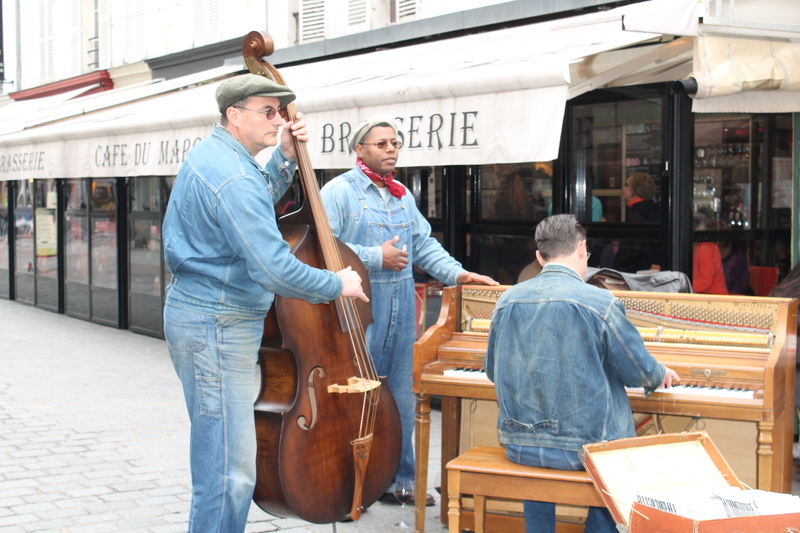 The day that we were there, a three piece jazz band was playing on the street, it gave the whole experience a very Parisian feel. Because this restaurant has been recommended by so many folks, it can get busy at times and like any restaurant anywhere in the world, it has its ups and downs both service and food wise. We were there at lunch time and sat on the patio. I would not say that the service was fantastic, but it wasn’t rude or anything, just slow, even for Paris. Le Café du Marché is most famous for their Duck Confit and on a normal day, I would have been all over that! But with my tummy just starting to feel like it might not evict everything, I decided to go with a much safer bet…pasta. It was exactly what I had expected and it worked fine for me. Was it the best meal I have ever had in Paris? Not by a long shot, but it was fine for what it was that day. Mom had either the roast chicken or the warm goat cheese salad. I can’t remember. This meal was not one of those that you remember forever, and trust me we have had quite a few of them! They do the best they can to cater to tourists as well as the locals that continue to frequent the cafe, if you are in the neighborhood, its not a bad place to stop. Here you can see the cafe behind that 3 piece jazz band. It was November so the glass was closed on the patio, but you still got the feel of being out on the street and we could hear the music without it being overpowering.